Notorious jailbird Charles Bronson has irked a victims' group by getting his art work displayed at Angel Tube. 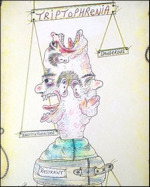 The drawing, to be shown for two weeks, depicts a bound inmate fighting with multiple personalities. Bronson, banged up for armed robbery since 1974, has spent most of his clink time in solitary confinement. This, says Benjamin Moore of Art Below, gives Bronson a 'unique' perspective on life and lends the felon's drawings an artistic novelty. The National Victims' Association, unsurprisingly, is 'astonished' and 'depressed' that the brute is getting such public exposure. It must have been a tough call for TfL's rubber-stampers, who have the unenviable task of applying black and white rules to the nuances of art and advertising. Previous bans saved us from exposure to images of graffiti, 500 year-old art work, a chubby Christ and, bizarrely, male breast feeding.